CLEVELAND (THEATRE DISTRICT) – Cleveland State’s basketball team could not find the combination to get the outside shot to fall Sunday afternoon and the end result was a 79-59 non-conference victory by Cornell over the Vikings here in the Wolstein Center. Cleveland State was 5 of 24 from three-point territory and Janelle Adams, who had the hot hand in Friday’s win over Western Michigan, was shut out out of the scoring column until the final four minutes of the game. Also, point guard Honesty King, who was in double figures scoring against Western, was held to no assists the first half, only one for the whole game and no points for the afternoon. Cornell used crisp passing, a patient and disciplined offensive set and an alert floor game to win the 50-50 balls on the way to the 20-point victory. The Big Red is coming off three games that were decided by three points or fewer, including two losses, but finally came away with their first sound win of the year. Giving away quite a bit in size by starting three guards and two forwards, Cornell, which hasn’t really relied on one chief scorer all season, went to Clare Fitzpatrick in the first half. Fitzpatrick hit some key outside shots as the Big Red began pulling away late in the first half. The junior communications major from Southbury, Connecticut wound up with a team-high 19 points and shared game-high honors in rebounds with nine. CSU’s Destinee Blue took some of the blues out of the Viking camp by putting up the best individual numbers of the game, scoring a game-high 26 points (almost all from the inside on feeds) and a team-high and shared game-high nine rebounds. Blue was also on in terms of percentages with 11 of 14 from the field and 4 of 4 from the foul line. Neither team got into any kind of foul trouble in the first half but the Big Red wound up with some of their 20-point advantage at the line, connecting on 15 of 19 free tosses while and Vikings made fewer trips but still shot 80 percent on 8 of 10. Shalonda Winton also reached double figures for the Vikings with 14 points, nine of those coming in the second half. Winton also took charge from the point, getting the ball inside and to Blue for a team-high five assists. Blue said the lack of outside scoring was due to the team not having the proper orientation in not matching up quite well with what Cornell was doing, as the Big Red controlled the tempo, per se, throughout the game. Coach Kate Peterson Abiad said the team never got into the flow of things but did add that it was a credit to Blue’s effort to get that many inside points despite not much action taking place on the outside to draw the defense out and keep from collapsing on the center, which often is the case in such situations. Because the Big Red was able to get such a big lead (as many as 22 points) in the second half, Cornell was able to get all its rookies into the game including Hathaway Brown alumna Sarah Poland. A Cornell freshman who was on three state championship teams at HB, Poland played the final seven minutes of the game, getting into enough action to register a blocked shot and an assist. Big Red coach Dayna Smith said she tries to get the team to the home town of each Student/Athlete at least once during her four-year career and was able arrange for the team to have dinner with the Poland family in Valley View Saturday. Seventeen of Cornell’s 29 baskets came off assists while 14 of CSU’s 23 hoops came off assists. Fitzpatrick, at 6-1, was the only starter above 5-9 but the Big Red was still outrebounded by only two, 38-36, for the game. TIMES: Games begin at 11:00 a.m., 3:00 p.m. and 7:00 p.m. both days. ADMISSION: $8.00 per person presale; $10.00 per person at the gate. through eighth in their assigned region. the football page at www.ohsaa.org Sunday morning, October 30, 2011. Division I - Saturday, Dec. 3 at Canton Fawcett Stadium, 7 p.m.
Division II - Friday, Dec. 2 at Massillon Paul Brown Tiger Stadium, 7 p.m.
Division III - Friday, Dec. 2 at Canton Fawcett Stadium, 3 p.m.
Division IV - Saturday, Dec. 3 at Massillon Paul Brown Tiger Stadium, 3 p.m.
Division V - Friday, Dec. 2 at Massillon Paul Brown Tiger Stadium, 11 a.m.
Division VI - Saturday, Dec. 3 at Canton Fawcett Stadium, 11 a.m.
With the win, the Terriers improve to 3-2 overall and the Tomcats fall to 0-5 overall for the season. Both teams exchanged leads in the early minutes of the first half. A basket by sophomore guard Marisa Thomas (Lorain/Amherst) at the 16:03 mark sparked a 9-0 scoring run by Hiram which led to an eight-point lead, 16-8, with 13:37 left in the half. The Terriers remained in control the rest of the period and led by as many as 11 points, 37-26, on a three-pointer by Shields with 2:28 left before halftime. Thiel recorded the only points in the final minutes on a last-second triple to cut the deficit to 37-29 at halftime. In the second half, the Tomcats made their run outscoring the Terriers, 15-8, in the first 6:58 of the period to pull to within a point, 45-44, with 13:02 left to play. Thiel eventually took that lead, but only had a 53-51 edge with 7:40 to go. Hiram came back to tie the game and a bucket by junior guard/forward Amy Geisman (Middleburg Heights/Midpark) along with another triple by Shields, gave the Terriers some breathing room with a score of 60-55 with 1:37 left to play. Thiel made it a one-possession ball game, 61-59, with 21 seconds remaining and following a missed free-throw attempt by Hiram, the Tomcats would fail to connect on the equalizer on their next possession. Hiram got the rebound on the Thiel miss, but would be called for traveling giving the ball back to the Tomcats under their own basket with less than a second remaining. But an errant inbound pass by Thiel prevented the Tomcats from getting a last second shot off resulting in a 61-59 victory for Hiram. Thiel had two players score in double-figures led by Kelly Muffley’s 16 points on seven-of-14 shooting (50.0 percent). She also grabbed nine rebounds. Ashley Davis was the other Tomcat in double-digits with 13 points to go along with nine boards. In addition, Kelly Barzak grabbed a game-tying high 12 rebounds. Shields was the only Hiram player in double-figures with her game-high 25 points on 10-of-21 shooting (47.6 percent) in addition to tallying eight rebounds. Senior All-North Coast Athletic Conference guard Kelsey Durichko (Brunswick) recorded a game-tying high 12 rebounds in the win. Oberlin, Ohio – For the first time in the Kerry Jenkins era, the Oberlin College women’s basketball team was defeated by Earlham College as the visiting Quakers erased a 16-point halftime deficit to defeat the Yeowomen 57-44 on Sunday afternoon at Philips Gym. It was a tale of two halves for the Yeowomen, who were led by 14 points from NCAC Player of the Week Allison Gannon, but 12 of those came in the first half. Kelly Warlich chipped in with 10 points, while rookie Christina Marquette ripped down a game-high 10 rebounds. In the opening half, the Yeowomen were clinging to a 16-15 lead with 7:54 to go, but they ended the session on a 15-0 run to take a 31-15 lead into the locker room. Unfortunately, the game took a drastic turn for the worse in the second half as the Quakers came out scorching hot and never cooled off – shooting 51.9-percent (14-of-27) over the final 20 minutes of play. Meanwhile, the Yeowomen went stone cold from the floor as their first points of the half didn’t come until the 14:45 mark on a pair of Marquette free throws that gave Oberlin a 33-24 lead. From there Earlham would tie the score at 33-all with 11:43 left to play. Following a quick 4-0 Oberlin spurt, the Quakers would take control and grab 46-40 lead with just over five minutes to play. Oberlin continued to fight, but could not get any shots to fall which allowed Earlham leave town with the win. After shooting 43.8-percent (14-of-32) in the first half, Oberlin made just 15.6-percent (5-of-32) of its attempts in the second to finish with just a 29.7-percent (19-of-64) success rate for the game. However, what was most glaring was that the Yeowomen deposited just 1-of-20 3-point tries on the afternoon. Earlham, which shot 21.4-percent (6-of-28) in the first half, finished the game at 36.4-percent (20-of-55). The Yeowomen did win the rebounding war 44-38 and outscored Earlham 32-18 in the paint. Oberlin returns to action on November 30 at Otterbein College. 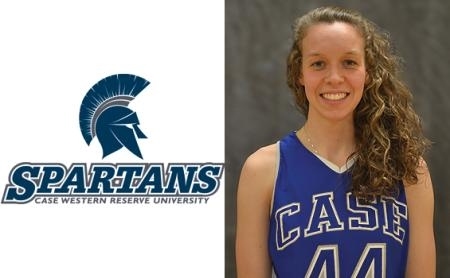 Tip-off is set 7:30 p.m.
Westlake, Ohio – The North Coast Athletic Conference announced on Sunday, November 27th, that sophomore Allison Gannon was named the athlete of the week. Gannon played outstanding last week in the Yeowomen’s win against the Bluffton Beavers. She led the Yeowomen with a total of 22 points, including shooting 10-17 from the floor. She added 13 rebounds and an assist as well. Her efforts led the Yeowomen to a victory with a final score of 68-56. Gannon and the Yeowomen are back in action this week when they travel to Otterbein University on November 30th. The tip off is scheduled for 7:30 p.m.
CLEVELAND (University Circle) – Senior forward Erin Hollinger (Chardon, Ohio/Chardon) scored a game-high 19 points, classmate Chelsea Peck (Pittsburgh, Pa./Oakland Catholic) bettered her career-high from a day ago with 15 points, and the Spartans flexed their defensive muscle surviving a late rally in a thrilling 56-53 victory versus visiting No. 12/16 nationally-ranked Denison University on Sunday afternoon in the final game of the 2011 University Athletic Association/North Coast Athletic Conference Challenge at Horsburgh Gymnasium. The Spartans level their record at 3-3 on the young season and will look to continue the non-conference portion of their schedule on Wednesday evening versus cross-town rival John Carroll University at 6:00 p.m. With the loss, Denison slips to 4-2 overall. For the game, the Spartans held the Big Red to 37.5 percent from the field (21-of-56), including 24 percent (6-of-25) in the opening half. In addition to her game-high 19 markers on 8-of-15 shooting and 3-of-4 at the free throw line, Hollinger added six rebounds and a team-best three assists. Peck finished with her career-high of 15 points on 6-of-8 shooting and a perfect 3-of-3 at the charity stripe. Freshman forward Berit Eppard (Englewood, Colo./Cherry Creek) finished with six points and six rebounds, while junior forward Marissa Miles (McDonald. Pa./Fort Cherry) added a career-best and team-high eight boards. Denison was paced by Alyx Ingram with 10 points, while Nicole Coggins, Paige Robnett and Kyli Parker each finished with eight points apiece. Additionally, Gretchen Staubach finished with seven points and a team-high nine rebounds. In the opening stanza, the two teams traded defensive stops as points were hard to come by. Tied at 17-17 with 4:15 remaining, the Spartans eventually possessed their largest lead of the first half at six (23-17) with just 32 seconds left capped off when Orcutt hit one of two charity tosses. That same score remained headed into the halftime intermission. The respective teams were able to find their offensive flows and the bottom of the net in the second half. Case maintained its lead with its largest advantage of eight coming several times in the final stanza despite attempts from the Big Red. However, Denison slowly chipped away extending the game with quick fouls and baskets and eventually cut the deficit to three at 56-53 with 21 seconds left on a lay-up from Parker. After a Case missed free throw, a pair of game-tying attempts by the Big Red fell short and the Spartans hung on for the 56-53 non-conference victory. Also of note, Case committed a season-low four turnovers as a team. KINGSTON, R.I. - Aaron Pogue scored a career-high 20 points and Cleveland State led from start to finish in a 67-45 win over Rhode Island in the final game of the Ticket City Legends Classic Sub-Regional in the Thomas M. Ryan Center on Sunday afternoon. The win allowed the Vikings to capture the Kingston, R.I. Sub-Regional Championship of the tournament with a 2-1 mark. Pogue was named MVP of the Sub-Regional, while D'Aundray Brown joined him on the all-tournament team. Brown had 15 points, four rebounds and four steals today. The Vikings wasted little time in jumping on the host Rams, racing out to a 12-4 lead just three minutes in and forcing a quick Ram timeout. A majority of the damage was done by Pogue, who dominated the first three minutes in the paint with a variety of moves on the low block and a baby hook. He scored seven of CSU's first 12 points, including a three-point play that put CSU up 7-4. Pogue went on to score 13 points in the first half, hitting 6-of-8 from the field. But he had plenty of help as CSU used its defensive pressure to force 17 first half turnovers that the Vikings turned into 18 points. CSU's defense also allowed the Vikings to get several easy looks at the basket, including in transition, as the Vikings shot .545 (18-33) in the first 20 minutes. CSU would push the lead to 13 points (21-8) on a Brown three-pointer with 11:40 to play, but the Rams responded with 11 straight points to cut their deficit to four (21-17) with 7:27 to play. But that would be as close as the Rams would get the rest of the day as the Vikings responded with a layup by Brown, a Pogue dunk and back-to-back steals and layups to push the lead back to 12 points (29-17) with 5:45 to play. The lead would swell to 18 points (40-22) at the half as the Vikings scored the final eight points of the half, including an Anton Grady layup just before the buzzer after a steal. The lead reached as many as 31 points in the second half when Trey Harmon hit a jumper to make it 59-28 with 11:38 left. CSU shot .518 (29-56) from the field and held URI to .396 (21-53). The Vikings also forced 21 turnovers, scoring 22 fast break points. CSU is back in action on Thursday (Dec. 1) when the Vikings open Horizon League play with a 7:00 p.m. contest at Wright State.